Nordic genre movies are invading Cannes! Six film producers from the region have joined forces to market and sell Nordic horror, sci-fi and fantasy at the world’s most famous and important film festival in Cannes, France. Billed ‘the Nordic genre invasion’ as a marketing gimmick, possibly referring to the Vikings who once raped and burnt their way through half of Europe, six film producers will open an office in Cannes during the festival, which lasts from May 16th to May 21st. The goal is to promote upcoming projects to film buyers and distributors. Finnish producer Tero Kaukomaa of Blind Spot Pictures (the company behind Iron Sky) and Norwegian producer Kjetil Omberg of Tappeluft Pictures head the Nordic genre team in Cannes. As producers they both have sci-fi and horror films coming up, but they also represent a handful of other Nordic genre films that are in development and seeking financiers and distributors. Kaukomaa is developing both Iron Sky 2: The Coming Race, the sequel to the successful indie Nazi sci-fi comedy from 2012. Omberg is producing Dead Snow 2, the Tommy Wirkola-directed sequel to the 2009 Nazi-zombie splatter fest. The other partners are Sweden’s LittleBig Productions with two movies; horror comedy American Burger and the sci-fi Capsulae 1,250,000, and Finland’s Fisher King Productions with a supernatural TV-series and feature film called Nymphs. Iron Sky co-producer 27 Films Productions is also represented with a TV series based on the Iron Sky franchise, called Iron Sky: Houston, We Have A Problem. Finnish visual effects supplier Troll VFX, who created the visual effects for Iron Sky, Nymphs and might also contribute to Dead Snow 2, are also presenting their showreel and introducing themselves to directors, producers and studios. 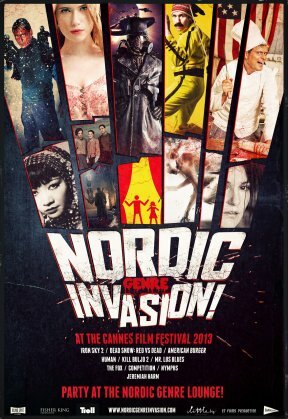 The Nordic Genre Invasion takes place at 24 Boulevard de la Croisette in Cannes, France. The producers are available for meetings, which can be booked at their website.